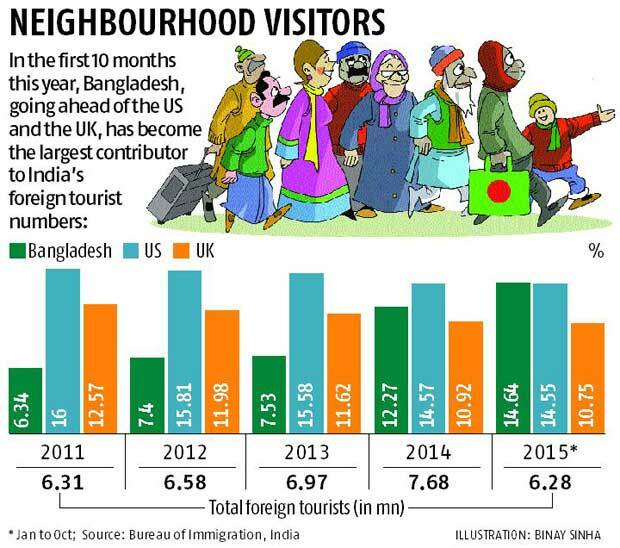 More tourists from Bangladesh came to India in the first 10 months this year than from the US or the UK - the traditional source countries of most foreign visitors. From January to October this year, 6.28 million foreign tourists came to India. Most of them were from Bangladesh, whose share was 14.64 per cent. US ranked second, with a share of 14.55 per cent and UK third with 10.75 per cent. This was a contrast to 2014, when US was at the top of the table with 14.57 per cent. Bangladesh was at the second spot with 12.27 per cent and the UK had contributed 10.92 per cent of the total foreign tourists visiting India. Last year, the number of foreign tourists coming to India increased by 10 per cent. Bangladesh had replaced UK as the second highest contributor to the numbers. For the past many years before that, the US was the source country with the largest contribution, accounting for about 15 per cent of the arrivals. Of the 10 per cent higher or 710,000 additional tourists who visited the country in 2014 (against 2013), 59 per cent were from Bangladesh. For some, this increase is a "mystery". Ajay Prakash, the former president of Travel Agents' Federation of India who runs Nomad Travels, said as much. But others provide a number of reasons - medical facilities, business ties - for the increasing numbers. Sources said the bulk of the increase in the number of visitors from Bangladesh was possibly driven by those coming for medical treatment. A report by KPMG, which provides risk, financial services and business advisory, internal audit, corporate governance, and tax and regulatory services, last year said Bangladesh accounts for the highest number of medical tourists (22 per cent) coming to India because of the lack of "quality health care infrastructure and unavailability of skilled manpower" in the neighbouring country. "India is a convenient option because of its physical proximity and similarity in culture, food and language," the report said. Besides medical tourism, business ties that many Bangladeshis have with the eastern states of India also prompt them to come here. "Medical tourism is driving tourist arrivals from West Asia, Africa and neighbouring countries such as Bangladesh. 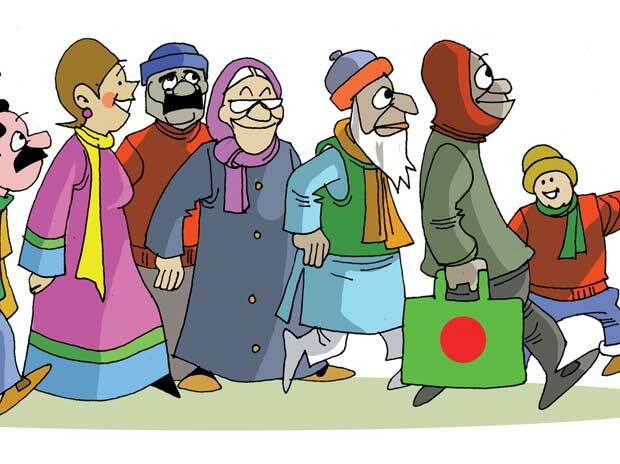 Many Bangladeshis would also have business ties with India, especially the states in the eastern region," said Sharat Dhall, the president of online travel portal Yatra. Trade appears to be one of the drivers as well, if one goes by the commerce ministry data. While India contributes to the bulk of the bilateral trade, import from Bangladesh rose 28 per cent to $621 million in FY15. The top items of import from Bangladesh are apparels, textile fibres, fruit and fish. India's export to Bangladesh also grew from $5.14 billion in FY13 to $6.16 billion in FY14 and further to $6.45 billion last year. Some of the items of we export to Bangladesh include cotton, cereals, salt, organic chemicals, vehicles, and iron and steel. Most of the visitors from Bangladesh seem to come by bus, availing the service between Dhaka and Kolkata - a distance of about 250 km. Haridaspur, a check-post in West Bengal, has ranked third or fourth in the top port of entry into India for most of the months in the current year. Prime Minister Narendra Modi visited Bangladesh in June this year. The two countries signed 22 pacts for greater cooperation. There is an emphasis on increasing connectivity between the two countries. In June, India, Nepal, Bhutan and Bangladesh signed a Motor Vehicle Agreement for seamless movement of people and goods across their borders.